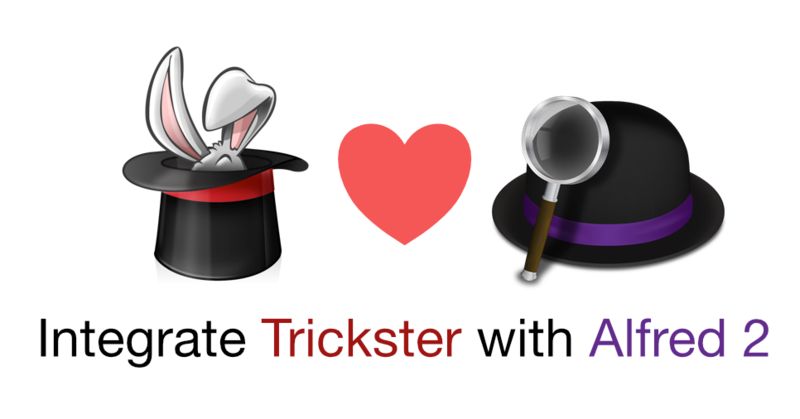 We’ve updated Trickster with a new feature and some bug fixes. Specifically, we’ve added a preference that can disable Finder folders from showing in the “All Files” list. Some users don’t like it that folders appear in the main list when they navigate in Finder. Note, Folders will still appear in filters that are set to show folders. We removed the dialog that would sometimes appear when Trickster detected potential problems with its watched folders (related to Sandboxing). If you don’t know what it means, don’t worry. Some users experienced a stuck Trickster because of that, and it’s not something we’d want you to experience. Thanks to the customers who gave the suggestions and reported the issues. Lastly, we’ve added a note that “Watch Folders” also includes all the subfolders of these folders. We’ve added this everywhere it made sense, including in the User Manual. Not really related to the release, but we’re adding articles sections to our site and one section is about Mac Productivity, where we’ll post some tips related to the topic. Click to read the Mac Productivity articles we have now. Watch the video below to learn how you can easily share scans from your iPhone to your Mac and have them appear automatically in Trickster for further processing. This workflow is something that we often use ourselves and it can save a lot of time. In this “how-to” video we demonstrate how to watch iCloud Drive folders for specific apps in Trickster, using Scanner Pro by Readdle as an example. You can use similar approach with other apps on your iPhone that share data through iCloud Drive. Of course you can also do the same when sharing files between your Macs through iCloud Drive. 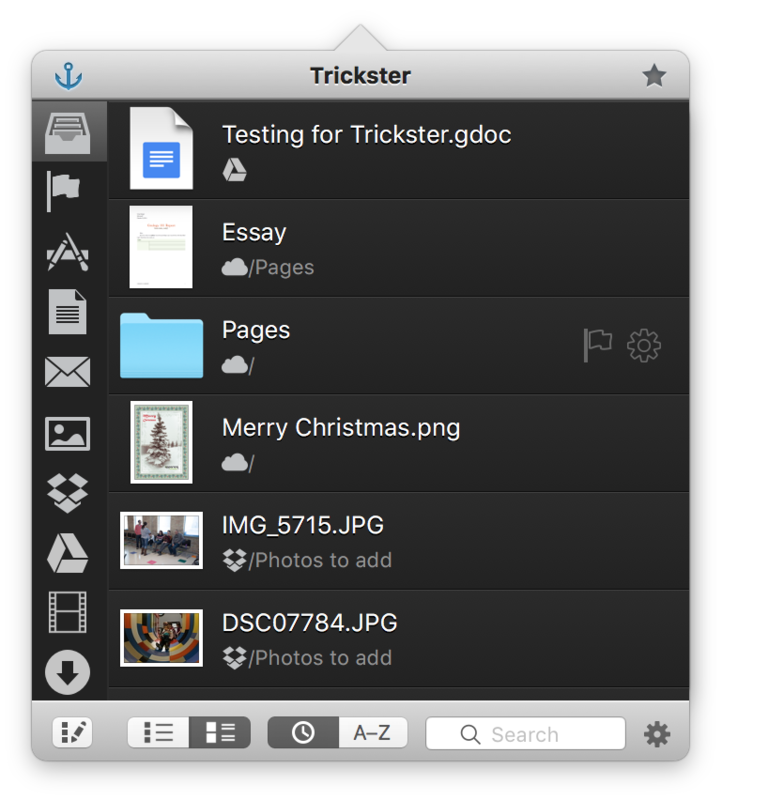 Trickster 2.4 improves support for cloud services including iCloud Drive, Google Docs. Files in iCloud, Dropbox and Google Drive will now display associated icons in their paths in the file list to make the paths shorter and easier to identify. We added two icons for filters, one for Google Drive and a generic cloud icon that could be used for iCloud. We simplified selection of iCloud Drive folder in File Tracking and Filter configurations with a dedicated button that opens the correct location. Note: adding iCloud Drive as instructed only adds the folders that you create and move there manually. 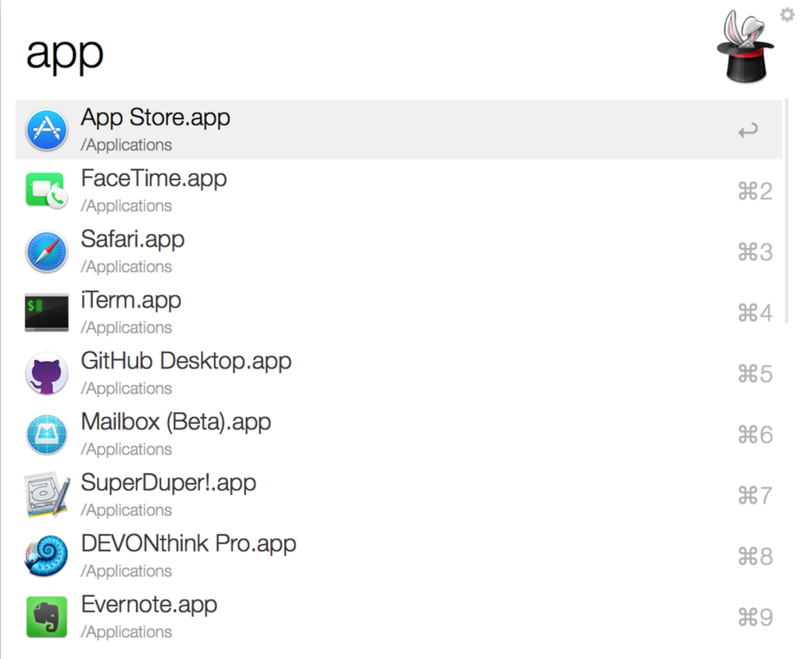 For app-specific folders in iCloud, select them and add separately. Google Drive document changes are now detected after they’re changed on the web, if Google Drive application is running. We’ve also fixed a number of bugs, including some crashes. We’ve happy to announce that we’ve worked with the people at Objective Development, who make the fantastic application LaunchBar, to create an action for it for a better integration with it than we previously had. 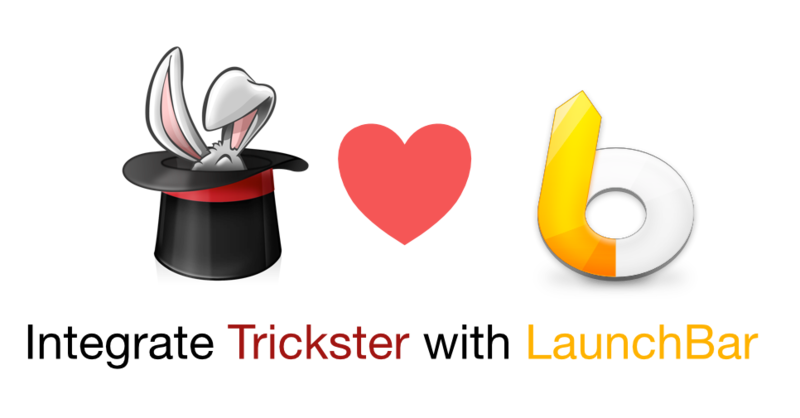 The action is called “Trickster Files”, so you can invoke by typing starting letters, such as tf or even shorter after Launcher learns it. We suggest adding a shortcut for the action (such as the letter t). Long press on t will show all the latest files which you further use like any other file list in LaunchBar. Another option is to show the action and press Command-Right when it’s selected to show the list of filters enabled in Trickster, then navigate the filters. Click on the icon below to download the action. After it downloads, double-click on it. LaunchBar will prompt you install it. It’s that easy. You can use LaunchBar’s “Instant Send” shortcut to send the selected file in Trickster’s own window to LaunchBar immediately, like you’d do from Finder. Very handy. 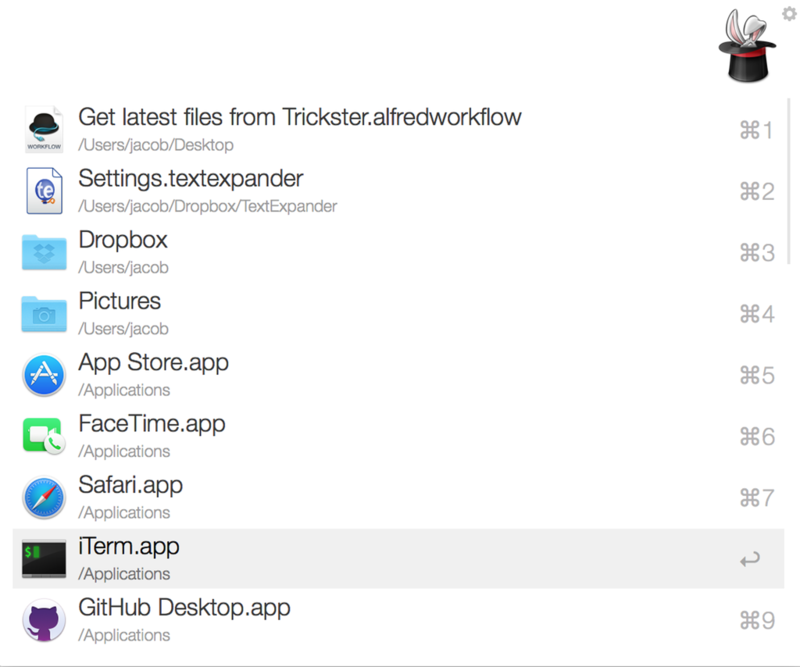 We’ve created a workflow that integrates Trickster‘s latest files list into the fabulous productivity tool for the Mac –Alfred. If you’re using both Trickster and Alfred, you should appreciate it. A hotkey, ⌘⌥Z, will show 30 most recent files from Trickster in Alfred’s own list, so you can use your familiar Alfred interface for opening, browsing or other actions that you like to do in Alfred. If you continue typing text, the query will be used to filter the latest 100 entries in Trickster for files that include the query in their path or file name. This is similar to how Trickster’s own filtering works. Default action for the workflow is opening the file and the Command key modifier will switch to Browsing it in Alfred, which is handy for folders. The workflow requires version 2.3.3 of Trickster, so please update it, if you’re using an earlier one. Did you know that you can add a droplet (such as one created by an FTP application or with AppleScript) to the Favorites sidebar and then drop files over the droplet to execute the droplet with this dropped file? With FTP droplets this will upload the file to the servers, as you’d expect. In fact, you can add any application the Favorites sidebar and drop files over them to open them in that application. Dropping files over folders will move them to the folders, by the way. To add something to the Favorites sidebar, you should first see them in Trickster’s main list and then move from there. 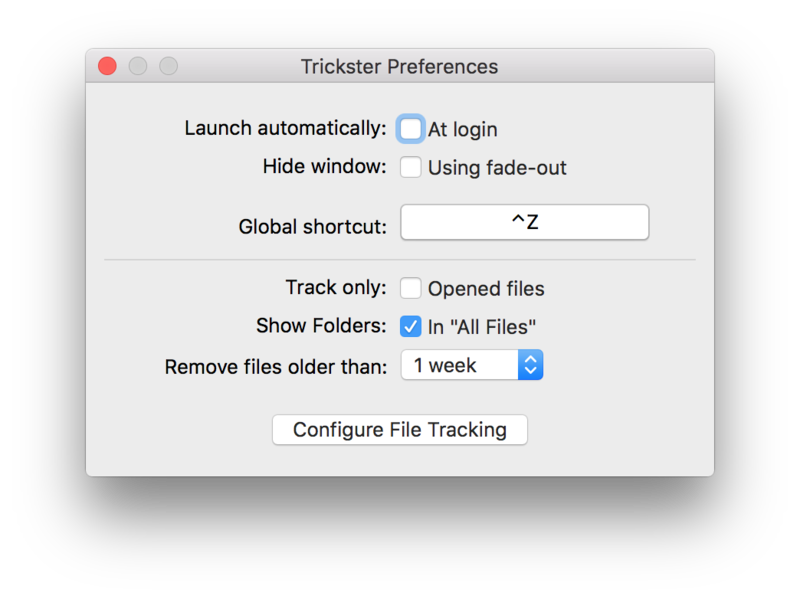 To add something to Trickster’s list you don’t have to open the file, you can even manually drag the file over the window and drop there to add it. Then drag it from the list to an empty space on the sidebar.